Basil is an herb, and all of its plant parts, leaves, seeds, and flowers, are used in herbal medicine, particularly “Holy Basil“. Basil is also used in desserts, including ice cream and sorbet, and custard. Depending on the variety of basil, it is used in Italian, Mediterranean, and Thai food. The essential oil is used in the preparation of perfumes. Verities basil include the Sweet Basil, Lemon Basil, and the two just mention, the Thai Basil, and Holy Basil. Basil is a member of the Lamiaceae family, and included with the plant species is the mint, oregano, catnip, rosemary, and sage. Holy Basil is related to the common Sweet Basil and is used in Ayurvedic traditional practices. The leaves are used to support healthy upper respiratory tract function, and research has shown that Holy Basil includes the benefits in helping to support a healthy immune system. 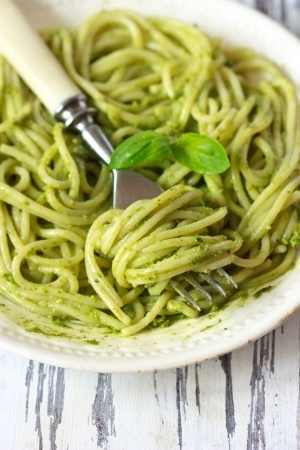 In our featured recipe – Italian Pasta with Pesto Sauce – we will be using the common Sweet Basil. 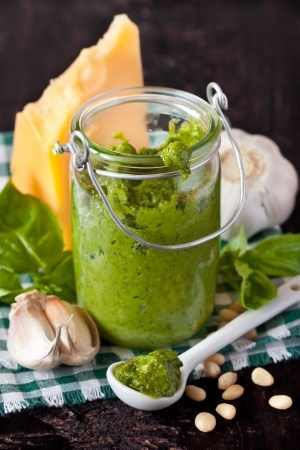 This meal can be prepared in 30 minutes, and here is what you will need, starting with the pesto recipe. Place all the ingredients in a food processor, except oil, and pulse. Start to add oil slowly, pulsing until ingredients form a smooth paste. If you do not use right away, or there are left overs, store in a jar container with a layer of olive oil on top to prevent discoloration. Prepare the spaghetti pasta according to packaged instructions. Just as pasta is done, place a large frying pan on medium heat. Then drain and rinse pasta. Set aside. Pour about 1/8 cup (1 ounce) of olive oil to the heated pan, let warm and then add the pasta to pan. Mix to coat the pasta and add pesto sauce, starting with a one half of a cup (1/2 cup) and mix to coat the pasta adding more pesto if needed and as desired. 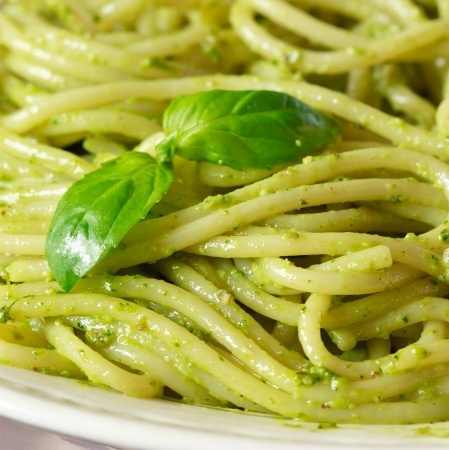 Plate the Italian Pasta with Pesto Sauce and serve. This entry was posted in Main Dish, Meals in 30 Minutes or Less, Pasta and tagged Arkansas Supreme Court, Auto rickshaw, Bangkok, Caesar salad, Europe, Food, Greater Boston, Healthy Snacks, holy basil, Lemon Basil, Sweet Basil, Thai basil, Thai cuisine, Thailand. Bookmark the permalink. This is a favorite in our house, so I grow lots of basil in the warm weather. Put up quite a few containers for the freezer to use all winter. It freezes so well, as long as you don’t add the cheese until it is defrosted. Thanks Roger!! Hope you van try it. Thanks for the comment and stopping by! Funny right. I could not fine any information were they came up with that name. Unless because that type is used for medicinal purposes over other basil varieties. Thanks RoSy for stopping by and commenting.